The cover page states wrongly Frederik Pohl as an editor (likely a relic from previous volumes in the Titan series). 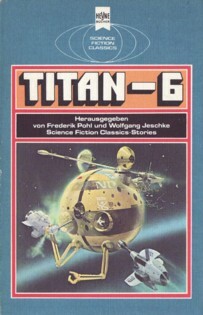 It's 'Titan-6' on the cover, but 'Titan 6' on spine and title page. "Die Straßen müssen rollen" ends on p. 127, but p. 126 is the last numbered one. The cover design ("Umschlaggestaltung") is credited to Atelier Heinrichs on copyright page. Month of publication from Science Fiction Times #143.